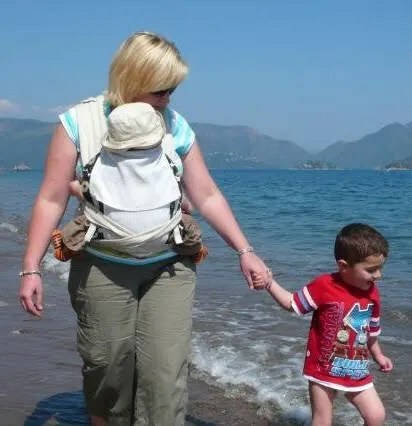 There are lots of different types of baby carrier, and for each type there are many different manufacturers and designs available to buy. This page summarises the different types; their features, suitability and pros and cons. There are also links to more information about each type and to the relevent page of the Library Catalogue. 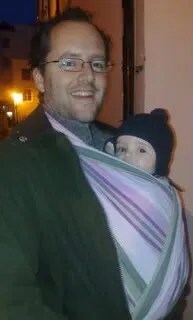 You can also read the Choosing a Baby Carrier page and take a look at the Carrier Comparison Chart. Various different types of carriers that are inspired by traditional carriers used in Asia; the most popular of these is the Mei Tai. All have a square or rectangular body with straps coming out of the top corners and fasten securely by tying the straps. Mei Tais are suitable for newborns, babies and toddlers and can be worn on the front, back or hip. Pros: Can be used from birth to toddler and with any sized adult; relatively easy and quick to use for front, back and hip carries. 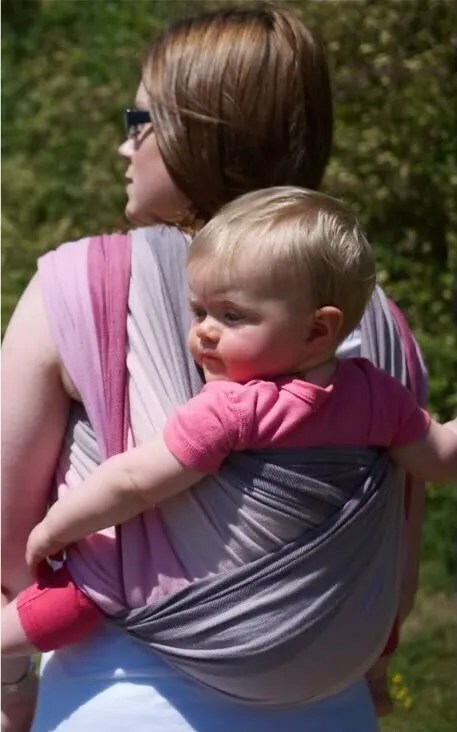 Cons: Long straps can dangle on the ground while tying; different sized carriers may be needed for younger/older children; different shaped carriers may suit different shaped people better. Based on backpacks designed for long distance hiking, these are very structured carriers with a metal frame to support a seat for a child. Used for back carries only from about 6 months to 3 years. Often have storage space or pockets and some are freestanding to use as a portable chair. 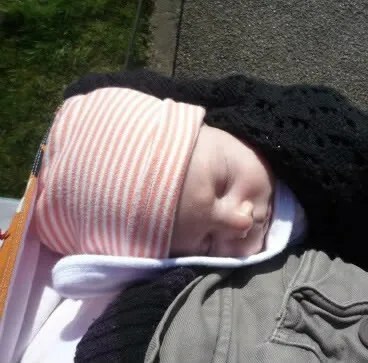 Pros: can carry lots of stuff as well as a child; can be used as a baby chair; suitable for long carrying periods; easier for a taller parent to get a high carrying position; widely available to buy. 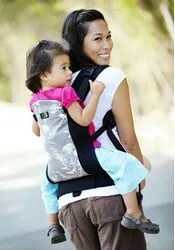 Cons: bulky and heavy to store and carry; only suitable for back carries and not from newborn; can be difficult to get a comfortable fit, especially for women; difficult to use alone. Widely available from all major baby equipment retailers; usually suitable from birth for front carries only. 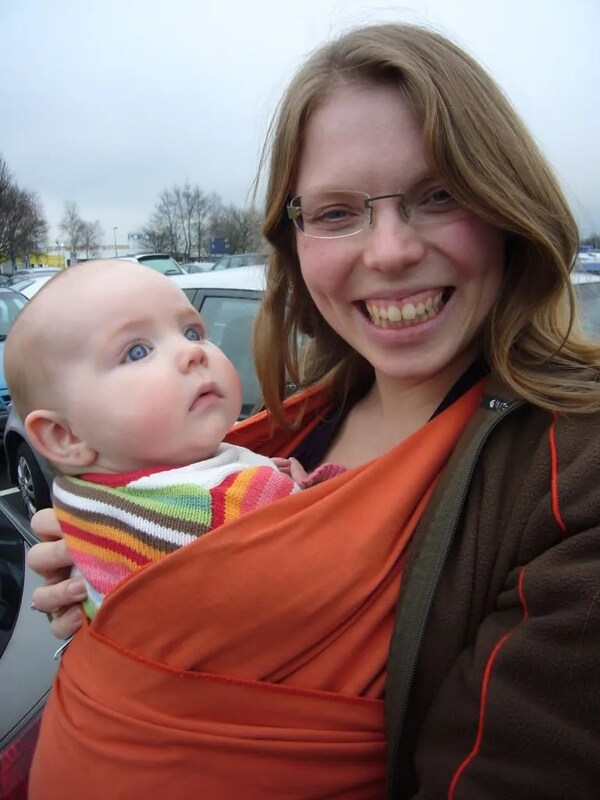 This style of carrier holds baby in a harness either facing the parent or facing outwards. They work by first attaching the harness to the parent, and then fixing baby into the harness. Most fasten over parent’s shoulders and around the sides, though some also have a seperate waist band/support. 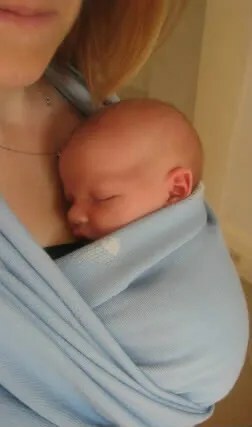 Pros: Most can be used from birth; facing outwards position possible; widely available to buy; very cheap options available; can be an easy way to start using carriers and slings. Cons: Not usually comfortable past 4-6 months; does not always offer recommended levels of thigh support for optimal hip development; structured shape makes it harder to get a good fit; needs to be adjusted between users; baby not always held close to parent’s body. 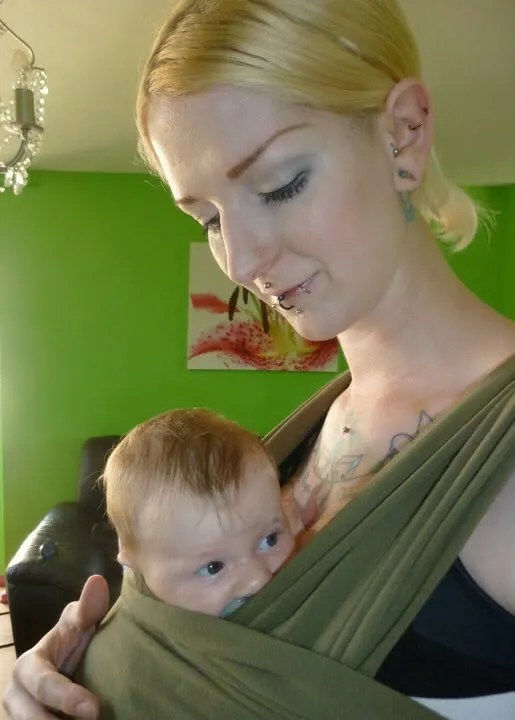 The Library currently doesn’t stock any Soft Structured Carriers that do not have a seperately fastening waist band/support – see Soft Structured Carriers for our current selection. Pouches are essentially a loop of fabric worn over the shoulder and across the body to form a pocket for a child to be carried in. Suitable from newborn to toddler for front and hip carries. Some pouches adjust using zips or buckles, and some are a fixed size with no fastening. Fixed size pouches should be chosen to fit the carrying adult. Pros: extremely quick and easy to use; folds up small to carry in a bag; same pouch can be used from newborn to toddler and for easy discrete breastfeeding; can work well for carrying twins. 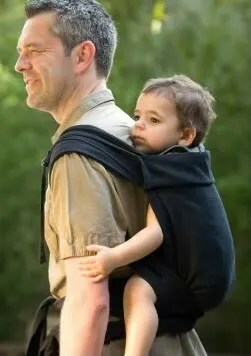 Cons: less adjustability can result in a less comfortable fit; weight supported over one shoulder only; not suitable for long periods of carrying; sized pouches need to fit each adult; back carries not possible. 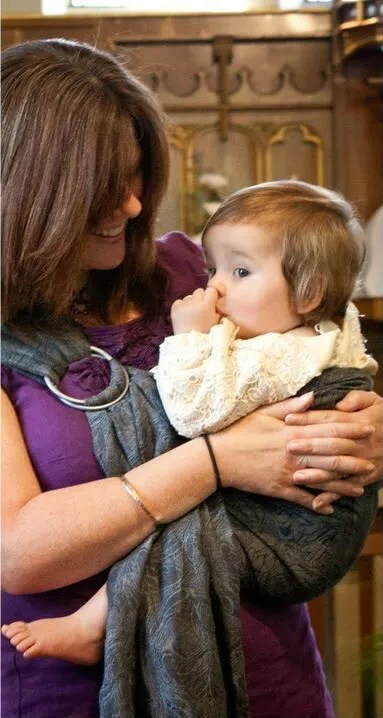 Worn over one shoulder, ring slings are a length of fabric with two rings sewn in to one end to create a very adjustable pocket for the child to be carried in. 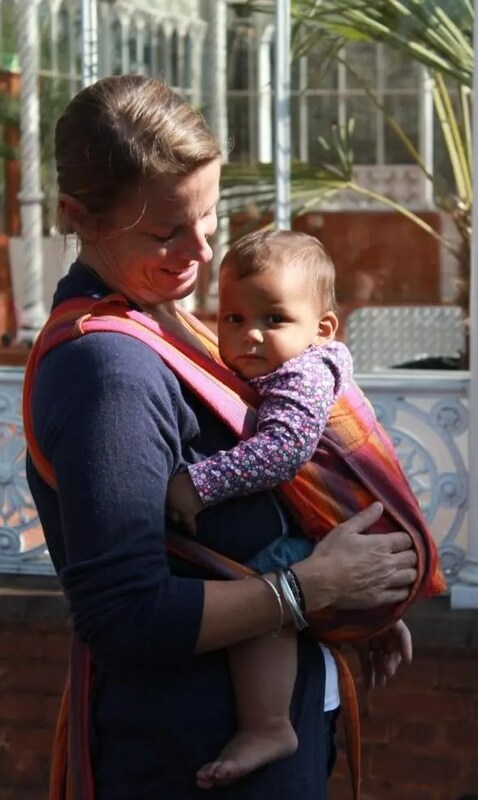 The fabric is threaded through the rings to secure and adjust the carrier to fit the parent and child. Suitable from newborn to toddler for front and hip carries. 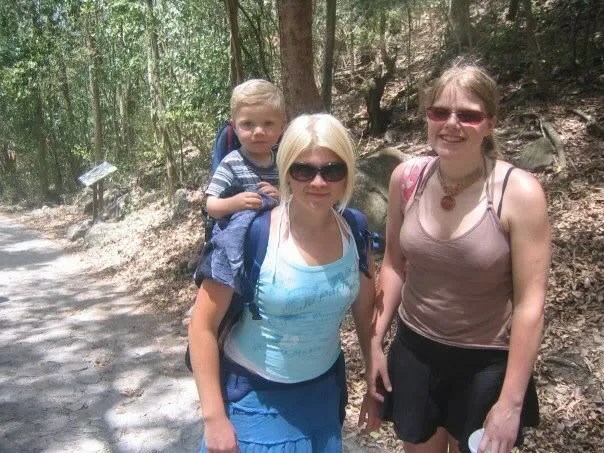 Back carries are possible for confident users carrying older children, though not recommended for long periods. 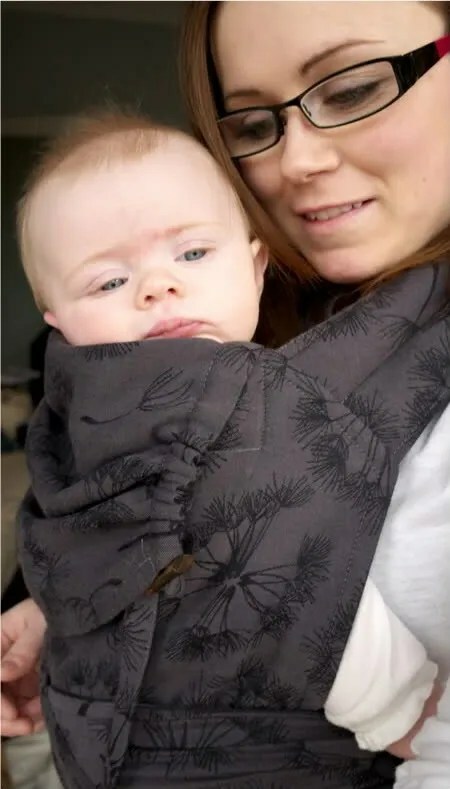 Pros: very quick and easy to use; folds up small to carry in a bag; the same sling can be used from newborn to toddler and for discrete breastfeeding; can work well for carrying twins; more adjustable and comfortable than a pouch. Cons: Weight supported over one shoulder only; not suitable for long periods of carrying. Fasten with straps and buckles around your waist and over your shoulders, holding your child close against your body for good weight distribution. Most have padding and additional features such as a sleep hood. Suitable for babies and/or toddlers depending on the carrier features and size. Some suitable from newborn, though may require adaptions or inserts to ensure a good, safe fit. Can be used for front and usually back carries and many can also be worn on the hip. Usually quick to learn to use for front carries, though back carries are a little more difficult. Pros: relatively quick to use; many are widely available to buy; no long dangling straps to tie; tend to have additional features like hoods, pockets, toy loops etc. 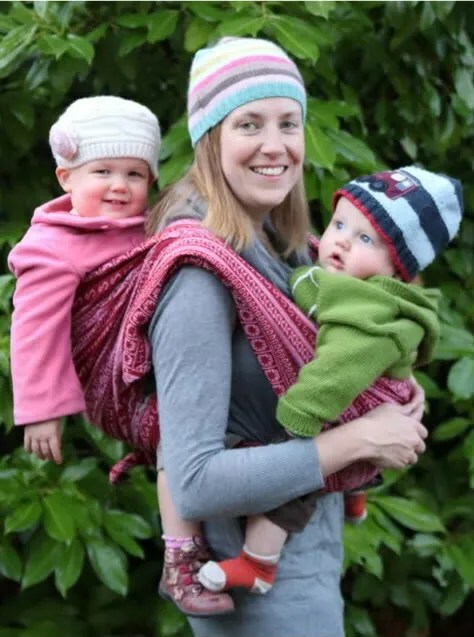 ; can work well for carrying 2 children at once; more ‘sporty’ look; facing outwards position possible with some SSCs; most are supportive to use for long periods if correctly adjusted. 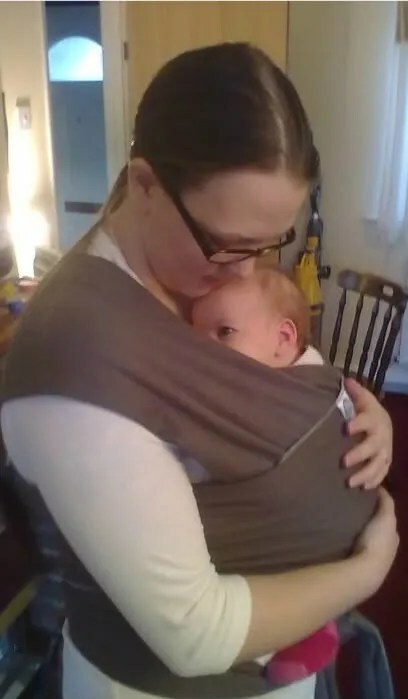 Cons: the same carrier isn’t always ideal for both newborns and toddlers; can be fiddly or awkward to adjust; more structured shape means it can be harder to get a good fit; not so easy to share between parents; not all offer the same levels of support; advertised weight ranges can be misleading. 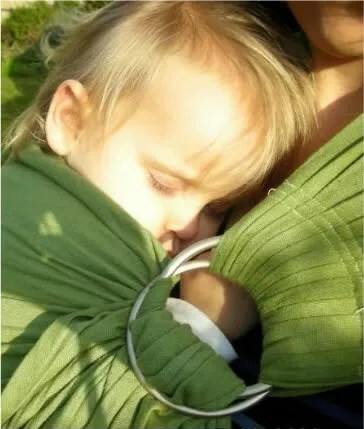 Long lengths of soft stretchy jersey fabric that you wrap around yourself to carry your baby securely. Suitable for front and hip carries and fantastic for newborns and smaller babies. Stretchy hybrid carriers use the same types of fabric and basic carrying positions, but have different features and fastening methods, which some may find easier to use. 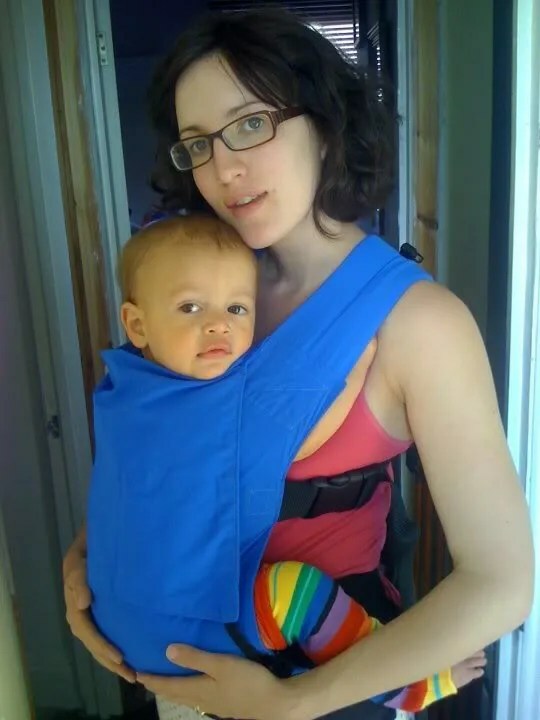 Most find stretchy carriers supportive up to around 6-12 months. 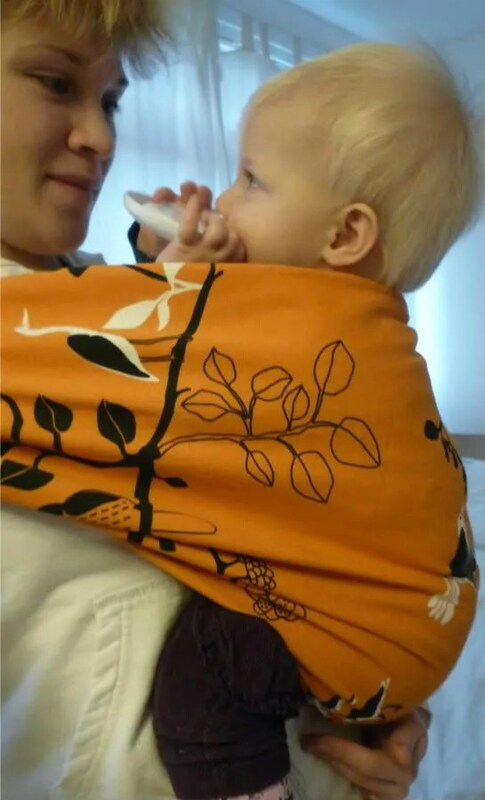 Pros: excellent for newborn and premature babies; once tied are quick to use (can be pre-tied and baby taken in/out without untying); easy to share between adults; soft supportive fabric; easy to wash; very ergonomic for baby and parent. Cons: lots of fabric to negotiate; can be hot in the summer; only suitable for 6-12 months; not suitable for back carries. These are lengths of specially woven fabric, tested and designed to be used to carry children from newborn up to about age 3-4+. 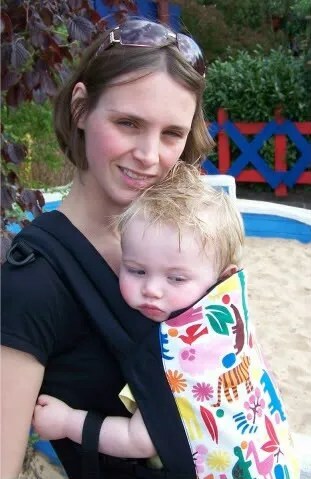 They can be from 2-5.5m long (the standard length is around 4.5m) and are suitable for a wide range of front, back and hip carries to comfortably support baby’s weight and to suit different parents. 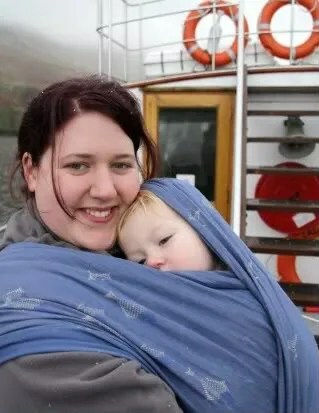 Pros: the same wrap is suitable for all children and parents; soft and comfortable to use; custom fit to each adult and child; most adaptable and versatile carrier option; very ergonomic for baby and parent; can be easier for safe back carries than other carrier types; attractive designs; can also be used as a blanket, hammock, scarf etc when no longer needed for carrying. Cons: longer lengths have a lot of fabric; can be hot in summer; steeper learning curve than some other carriers; huge range of fabrics and options available can be confusing.